Breckenridge real estate has experienced a steady incline in appreciation since 1990. If you’re looking for a second home or an investment property Breckenridge may be the place for you. Nearly 90% of the Breckenridge real estate owners are investors or second home owners. Throughout the 1990’s Breckenridge has averaged at least a 10% real estate appreciation rate. In the early 2000’s the Breckenridge real estate market flattened in some areas and dipped slightly in others. This was a direct reflection of the overall decline in real estate sales nationwide after the September 11th tragedy. However, real estate in Breckenridge wasn’t impacted for very long. In 2003 and 2004 we were back on track with appreciation levels reaching 9% and higher. The real estate market reached new heights in 2005 and 2006 reaching appreciation levels of 20% and more. During these two years, while the rest of the nation’s real estate markets seemed to have suffered, with a record number of homes in foreclosure and with a plethora of properties on the market for sale, Breckenridge continued to grow and beat all previous real estate records. It’s difficult to determine why Breckenridge CO real estate sales have sustained such incredible levels of appreciation while other markets have declined. But, there are several theories as to why Breckenridge has continued to grow. One being Breckenridge is of course a niche for second home owners. With a simple commute from Denver, Colorado Springs, Fort Collins and other Front Range locations, Breckenridge is easy to get to for a short weekend get away. 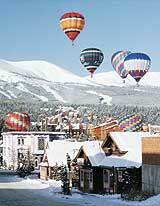 Breckenridge is also easily accessed from the Denver and Colorado Springs airports. Another explanation for Breckenridge experiencing encouraging appreciation levels over the years is it continues to offer exciting lake, mountain and ski properties for a great value. Unlike Aspen, Vail, Beaver Creek and Telluride, Breckenridge real estate proves to be “reasonably priced” and a great investment by many buyers standards and expectations. For more information as well as charts, graphs and statistics on Breckenridge real estate, take a look at our Breckenridge Realtor stats section. Breckenridge is the most-accessible Colorado mountain resort located only 90 minutes west of Denver International Airport and a little less than 2 hours from Colorado Springs. Breckenridge is the Nation’s #1 ski destination for the second year running. It’s no wonder Vail Resorts invests millions into capital improvements designed to make the Breckenridge experience more diverse, more exhilarating and more convenient than ever. Settlers crossing the Continental Divide with dreams of gold in 1859 first inhabited Breckenridge. “The Kingdom of Breckenridge” is a perfect illustration of Old West meets modern resort. Breckenridge boasts one of Colorado’s largest Historic Districts with more than 250 designated Historic sites. Breckenridge has over 200 unique shops and a variety of restaurants to satisfy all. Breckenridge truly has something for everyone. Some favorites include: skiing, sledding, snowmobiling, dog sledding, ballooning, snowshoeing, Nordic skiing, ice skating, and dinner sleigh rides. Historical tours are available, or you may take an authentic underground mine tour. Once the snow melts, another side of Breckenridge appears. Bright blue skies, mild temperatures and colorful wildflowers make Breckenridge the ideal summer destination. If you ask any of our friendly locals why they came here they’ll say: “I came for the winter but stayed for the summer.” The reason is as clear as the bluest summer skies, with more than 300 days of sunshine per year, heavenly days are the norm here in Summit County. The mountains truly come alive with vivid colors blanketing the landscape, wildlife roaming the hills and hundreds of miles of backcountry trails that unfold infinite exploration. Eighty percent of our county is National Forest, and summer has always been our best-kept secret. But, in the last few years, summer has become nearly as popular as our winter season. A Breckenridge summer offers more than you can imagine from: hiking, biking, camping, backpacking, street festivals, music concerts, live theater, alpine slides, chairlift rides, 5 golf courses, fly fishing, kayaking, sailing, canoeing, white water rafting, four-wheeling, ghost town tours, gold panning, horse back riding, in-line skating and so, so much more. So come and enjoy and keep in mind that you’ll be back! For more information on Breckenridge real estate contact Kelli today!